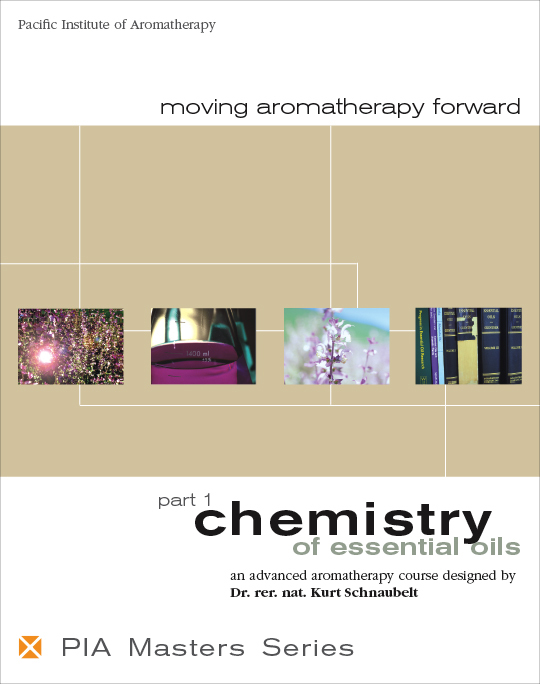 A brief overview of the fundamental concepts of chemistry, relevant to the needs of the aromatherapy student. A closer look at the chemistry that goes on in the plant shows how natural substances are linked to one another. For instance how essential oil terpenes are building blocks for cholesterol, sexual and adrenal hormones or also carotenes. 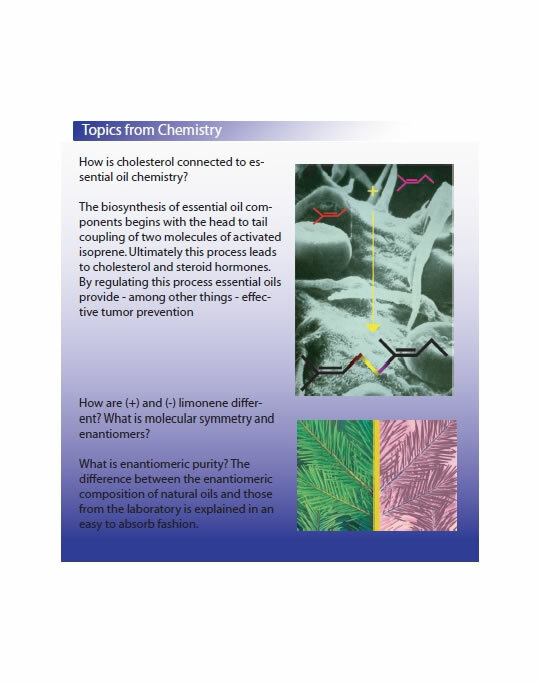 This chapter provides important fundamentals for Part II, The Biology of Essential Oils. To acquire an intimate understanding of the actual makeup of an essential oil, the composition of Lavender oil is taken as an example. From leaf alcohol (green leafy fragrance) to cis-octenol (strong mushroom odor) to linalyl acetate (pleasant fruity ester odor) some 40 compounds are discussed and their chemical formulae are given to illustrate the variety of components that can occur in an essential oil. Approximately 20 of the most interesting components are included in the olfactory toolbox in their pure state to allow the student to experience the spectrum of odors which all combine to make Lavender. Many essential oils derive their characteristic fragrance and therapeutic properties from compounds present only in a very low concentration, which nonetheless has distinctive fragrance impact. Their intensity makes these compounds especially interesting for healing as well as perfumery. Trace components of Rose, Jasmine and many others are discussed. Particularly striking examples are included in the olfactory toolbox in their pure state. Unlike most laboratory chemicals essential oil components are synthesized in the plant with specific symmetry constraints. Chirality and enantiomeric purity, the latter a significant tool to ascertain the authenticity of essential oils, are discussed. Gas chromatography and other relevant methods are presented. The possibilities and especially the limits of these methods are discussed with respect to proving authenticity and detecting adulteration. The French approach to aromatherapy relies heavily on ascribing certain properties to specific components of a given oil (‘functional group’ concept). This approach is older as one expects and its development, as well as its obvious limits in the wake of new biological discoveries, are discussed. The chemotype concept of essential oils is a direct result of the ‘functional group’ approach. The strengths and limitations of the concept are evaluated. Chemotypes offered on the market are discussed with respect to how important and useful they actually are. The literature dealing with the chemistry and the composition of essential oils is vast. Selected titles, putting emphasis on a more academic approach are introduced.